Often my friends ask me to suggest them a budget Bluetooth earphone, and I reply them back saying, ‘Bluetooth Earphones’ and ‘budget’ doesn’t go well together. If it does, it affects the quality of audio output so drastically that it defeats the purpose of getting wireless. You need good audio more than wireless technology. Wireless technology comes at a price. And the audio output should be the priority over everything. You will get so many good options if you ask me about wired earphones under 1k. 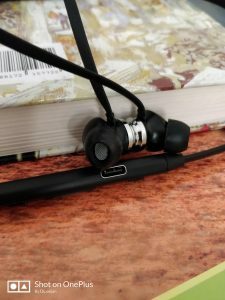 The Mi In-Ears Basic, Mi In-Ears (with 3 Headphone Buttons), Sennheiser CX 180, JBL C100SI, 1More Piston Fit, and my latest favorite Focal Sense are excellent wired earphone options to consider under Rs1000 that have relatively good enough audio quality. But, when it comes to wireless earphones, I had nothing to suggest that would satisfy a user regarding audio output quality. So, I either advised to increase the budget to at least 3k and go for an excellent wireless earphone and use a budget wired headset for now. But, it seems finally I can suggest some Bluetooth earphone in the 1k range. The Bluedio Turbine (TN) is a Bluetooth earphone in the budget range. It also supports active noise cancellation (ANC), although it is not much strong, as its just an earphone. Above everything, I am reasonably satisfied (as well as surprised a lot) with the audio output! It’s the prime reason I recommend this earphone. I will discuss them later. 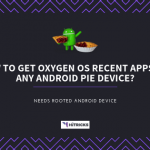 By the way, this post is jointly written by me, Nirmal, founder of this blog, and my friend Dipanjan, who is also a tech geek. We both are using these earphones for over five months. We both own a OnePlus 5T, so, the review was essentially similar for both of us. Bluedio TN is not manufactured in India. 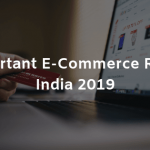 You will find some third party sellers selling it on Amazon India at a high price (around 2k), but you can quickly get it at AliExpress for lesser price-point. There’s an upgrade to Bluedio TN, called Bluedio TN2, with minor updates like auto-pause when taken off from ears, etc. and having similar pricing. 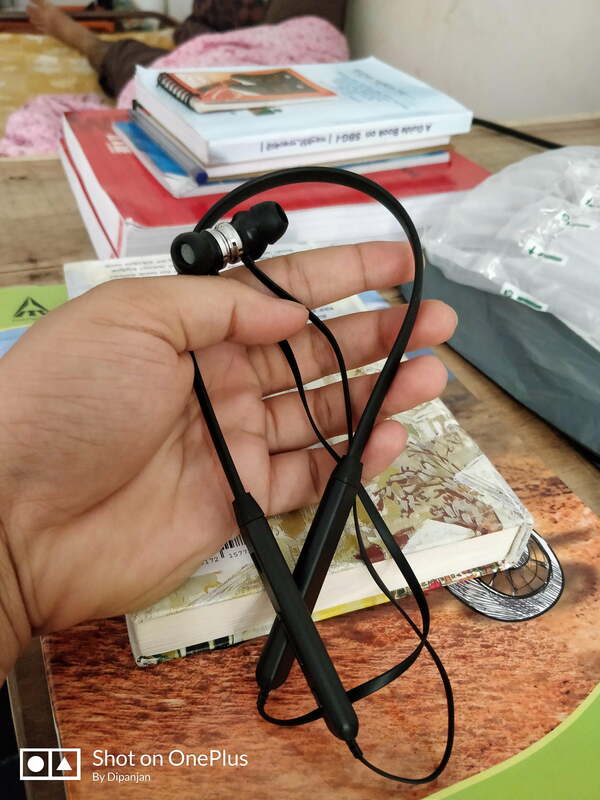 Now, the regular pricing of these earphones are around 15$, but keep an eye on them, during AliExpress sales they easily go down to below 10$. Also, on a new AliExpress account, you can apply 4$ coupon to decrease the price further. 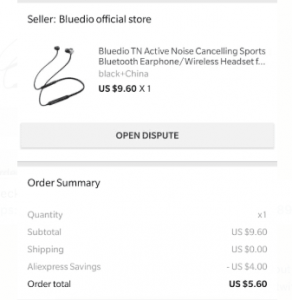 We bought the Bluedio TN in July 2018 for less than 6$. The sale price was 9.6$, and after applying the coupon, the final price was 5.6$. It took around three weeks to deliver. And it went through Customs. However, no extra customs duty were needed to be paid as the price was below 5000 INR. The outer packaging was a little beat up, perhaps due to the long way transfer. However, the branded box came with a high-quality air-package to ensure no physical damage — kudos to Aliexpress for the packaging. 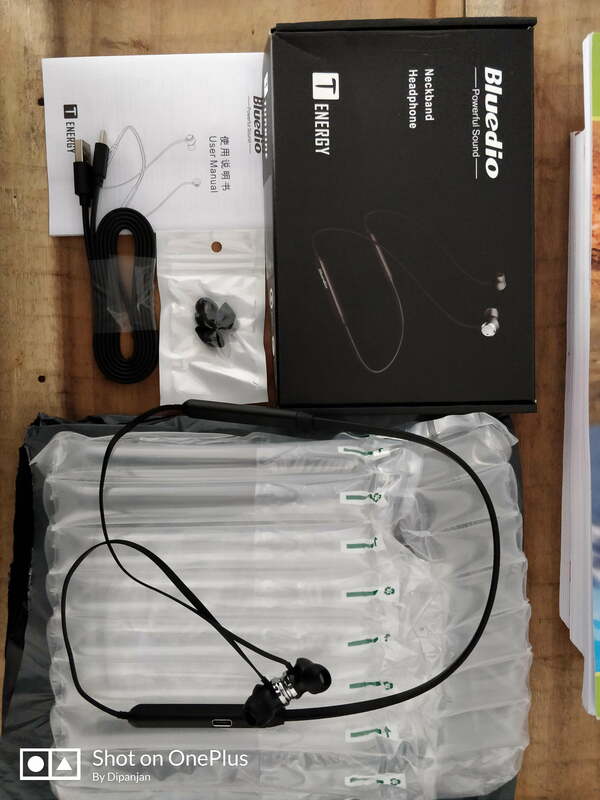 Coming to the box, the box isn’t that impressive, but I am not here to complain about packaging since what I got these earphones for, doesn’t even justify me to pick on this details. We will come to the price in the later. The box contains the earbuds, silicone tips, an extremely long high-quality flat Type C charging cable and a user guide. I know, it’s pretty basic. The design is somewhat unique in this earbuds. The ear tips are slightly inspired by Sennheiser maybe, but they are entirely made out of plastic. The lack of metal or any alloy contributes to the lightweight of the earbuds. But the outer shell of the ear tips could have felt more robust if they were metallic like the Bullets Wireless. However, at this price, this is sth not worthy to complain. The ear tips are magnetic though, so you can snap them together around your neck when you are not using them. Both ear tips have mics on the opposite side for ANC to function. 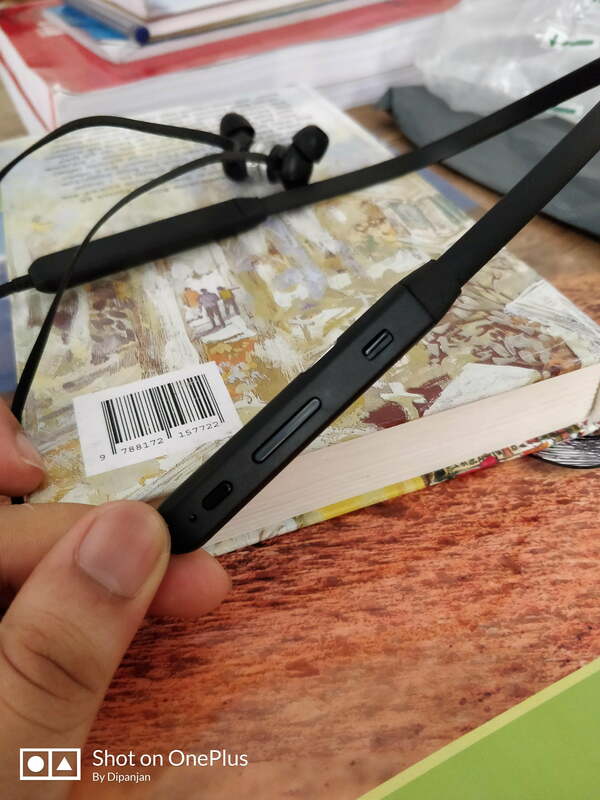 The cable connecting the ear tips to the earphones are flat on either side. The earphone base is also made out of plastic. The right side houses all the controls present. There’s the on/off switch, volume controls, and active ANC switch. The on/off also switch functions as Call receive and end button during calls. It can also be programmed to launch assistant on a long press. The left side, however, is bare. The earbuds house 13 mm drivers and offer a frequency response range of 20- 20000 Hz. The sensitivity maxes out at 116 dB. However, they do not provide AptX, but they have ANC. The sound quality is okay for the price according to me. The sound is extremely loud for the price. Probably these are the first earphones that compelled me to not go beyond 70% volume. Going beyond that becomes uncomfortable just because of the sheer volume especially when you are in a quiet environment. The sound lacks in the bass segment a little bit. The treble is set high. You can make some EQ adjustments to fine tune it, but I think bass heads like me would like for little more bass. Vocals are extremely clear though, thanks to the broad frequency response. The earphones are mostly comfortable too. 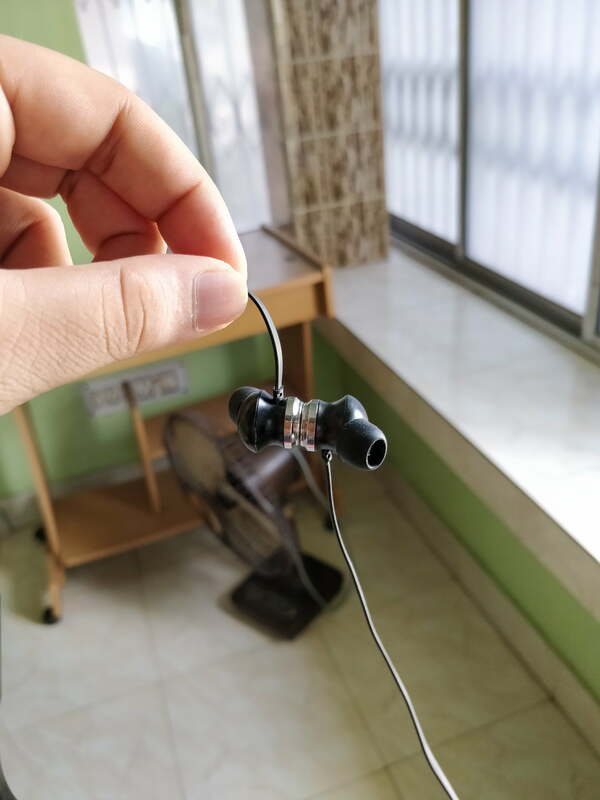 The earplug design is somewhat unique. They use an oval design, but once you get the right ear tip to fit, you are good to go. The earphones being light don’t necessarily feel uncomfortable or strain your ears after prolonged sessions of usage. The ANC feature is somewhat finicky in this one. I have used Sony XB950BT, and that ANC is just out of the world. I know there no comparison between the two when it comes to price, but with the ANC tag on it, I expected better isolation than it offers. The difference is extremely minimal with ANC on or off. This is one thing that most Bluetooth earphones disappoint people since most don’t keep up to the official numbers they boast about. However, this was a pleasant surprise in this case. The earphones fully last the claimed 10-12 hours of music or call time, without ANC. I had to charge once in almost three days on most occasions. With ANC on, the battery life comes down to 7-8 hours. They charge via USB type C. It takes around 80 mins to charge them up entirely. There’s no fast charging like the Bullets Wireless but the charging time is similar to most other products in this domain. One thing though, during my testing, I experienced a Bluetooth bug where the earbuds will disconnect automatically at 60% leading me to believe they were dead at 60%. However, this was probably an issue with beta software on my phone. On the stable version, I incurred no such problems. 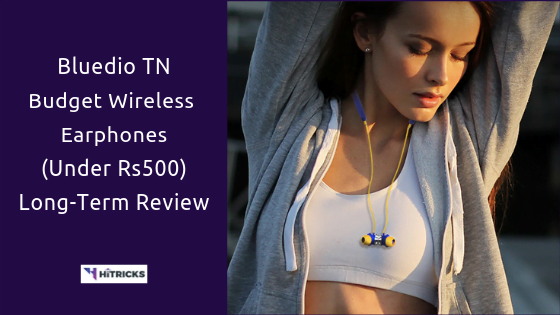 In India, most decent Bluetooth earbuds will cost one around 3k to 4k INR at least. If you target for Sony, Sennheiser, RHA, prepare to shell out another 2k at least. However to keep things in perspective, I took three most popular Bluetooth earphones the Skullcandy Ink’d Wireless, JBL E25BT, and the Oneplus Bullets Wireless. Now I haven’t used any of these personally, but they have one thing in common, they all cost above 3k even with offers on. 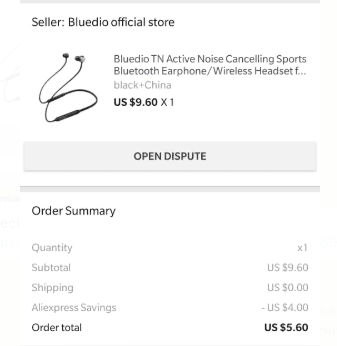 I got these Bluedio wireless earbuds from Ali Express at 5.60 USD, which roughly converts to 397.80 INR. At this price point, one barely gets a decent pair of regular earbuds, let alone Bluetooth earbuds. However, at its official price of over 21 USD, it might not be a good deal. But it often retails for under 13 USD on offers. At that price, I think it’s an extreme Value for Money proposition. And if you can bag it at the price I got, there’s no competition for it. These might not offer as many features as the Oneplus Bullets Wireless, or it may not have the bass of JBL E25 BT, or the style if Skullcandy Ink’D, but for the right price, these Bluedios are an unbeatable product. The Bluedio TN Bluetooth Earbuds are excellent Earphones to consider buying if you are on a tight budget and still need a Bluetooth earphone. If you just care about audio quality, these are the best in their price point. It goes fairly loud and still doesn't distort. However, it does have some connectivity issues especially if you are multitasking. If you are an iPhone user, I would recommend skipping this one. 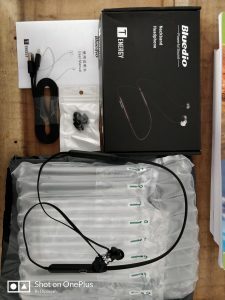 Bluedio TN Long Term Review: What holds up and What didn’t? Okay, after prolonged usage of 5 months, there are some critical updates to deliver. Let’s start with the good part. Firstly, the audio quality didn’t degrade over time. It still the same old powerful audio that you can safely listen to at high volume without any distortion. If sound quality is all you care about, then this should relieve you. Also, that means that the earphones were working and functional over these five months of usage. I want to confirm you, that these are still my daily driver till date. They always stay in my neck when I am on the go, on my way to the college and back. During college hours, and at home, I throw them inside my bag in a typical pocket meant for everything from pens to keys. Also, sometimes, it gets subjected to medium to massive pressures inside my backpack while traveling. It didn’t give up. The physical endurance of these earphones is excellent. Now, let’s come to the bad part. And, there are significant points to tell. Connecting iPhone and Android: This issue is a disaster, leading me to disconnect Bluedio from my iPhone SE completely, and only keep it connected to my OnePlus 5T. Till the time it is connected to OnePlus 5T alone, everything works fine, but the moment I connect my iPhone SE side by side, the earphones go to some Doomsday Mode. It starts making some ‘Brrrrrrr…’ noise through the earphones. The sound keeps on going continuously and overrides every other function of the headset. You can’t use the controls; you can’t switch it off, you can’t do anything. I had to wait until the earphones were drained to 0% and stopped on its own. After that, I charged it, and it worked fine with the OnePlus 5T or iPhone SE alone. Connecting both of them recreated the issue again. This issue also wasn’t there at the beginning. It started appearing after two months of using the earphone. I don’t know the reason. So, time for me to give you my verdict on this earphone. Well, if you have read the article, I have made all positive and negative points clear, so, perhaps you have already made your mind over this product, whether to take it or not. Whenever it comes to recommending a product to someone, I always consider its price point. And that’s where it breaks all barriers and becomes my favorite recommendation. We grabbed it at a mere Rs400. At that price point, I don’t expect a groundbreaking product at all. The fact that I most care about is the audio quality, followed by the endurance. That is where they tick the boxes right. The earphones have excellent audio quality for the price, trust me. I use an ATH M50X Studio Monitor Headphones, and I can recognize a good sound fairly. This is perhaps the best sounding earphones below 1k; you can count on me on that. That’s all about the Bluedio TN. If you are incredibly tight on budget but badly need a Bluetooth earphone, I would say you can go for this. Especially, if you are one of the unlucky guys who is deprived of headphone jacks, then, this step is inevitable. If you decide to buy, go for the upgraded Bluedio TN 2. Below are the links for both. If you have further queries, you can comment below. I will try my best to assist you. And don’t forget to share this post with your friends who are waiting to grab a budget Bluetooth earphone. Use the social share buttons below or on the left if you are on the desktop.